In general make sure mirrors are angled so as not to reflect your sleeping body. In general, mirrors should not over light the bed in any way, either from the head, foot or side of the bed - in other words you should not be able to see yourself in any mirror as you lie in bed. Mirrors as reflective tools increase light and therefore can increase yang qi in the room to more than a desirable level - we need peaceful yin qi in order to sleep soundly. It is also important that mirrors are not situated on negative geopathic stress energy lines. They will amplify this detrimental energy compounding the symptoms. This could impact badly on your health, relationships and luck. Mirrors placed opposite each other can activate spirit pathways. At worst mirrors may act as portals into other dimensions and activate spirit pathways. This may create a haunted bedroom, which is hardly ever a good idea. These pathways can make an avenue for spirit visitation from far afield, not just beings associated with the house. Be especially mindful of mirrors directly facing each other. 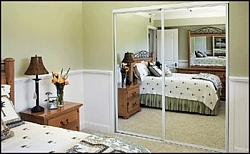 Mirrored wardrobe doors in bedrooms are a popular way of increasing light and space in what is sometimes a dark room. As stated above they are not helpful and can be particular harmful to older folk. While mirrored doors increase light and space they increase yang qi which may exacerbate insomnia. 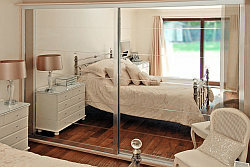 If you can't avoid mirrored wardrobe doors or a dressing table mirror aimed at you, then cover them with a cloth or sheet before you go to bed. At least try covering them for a couple of weeks to see if your sleep improves. So for safe and peaceful sleep don't position your mirror so that it can capture your reflection while sleeping in bed - instead the best mirror placement is behind the door, in the wardrobe or at least angled away from the bed. 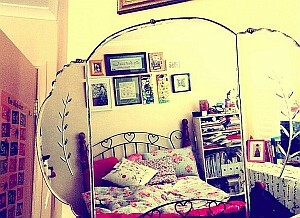 This placement of the mirror is inoffensive as it is not over lighting the bed.